Day 3 of the Spirit of America Individual Aggregate (Thursday, 9/13/2012) started out cold and misty. Everyone was pretty much wearing every shred of clothing they had to get thru the morning, but the afternoon warmed up nicely. Short range was typical; constant and relatively calm at 300 and 500, but the wind kicked up about the time we started shooting 600 and some points started falling. After lunch we shot 900 yards and the points really started falling! As expected, the chaos shook up the standings quite a bit. In the sling class, Noma Mayo was the high shooter at 4 points down. Noma shot a miss at 600 yards, challenged it, and lost the challenge. She finished the range, then later went to the stat house and had the miss removed from her score card. A formal protest was filed, but her amended score stood (without a miss). Needless to say, the result is somewhat controversial, especially considering that Noma is in contention to win the tournament. The current standings in the individual sling aggregate are: Nancy Tompkins at 6 points down, Noma Mayo at 8 points down, and Bryan Litz at 9 points down. In F-TR, Trudie Fay continues her dominant performance at 13 points down to win the day. Trudie is also leading the F-TR aggregate with one day to go. Tomorrow is the Raton 8-man team match. Larry Bartholome won the F-Open class at 7 points down for the day (Aggregate standings were not posted as of when we left the range so it’s difficult to calculate those full standings). 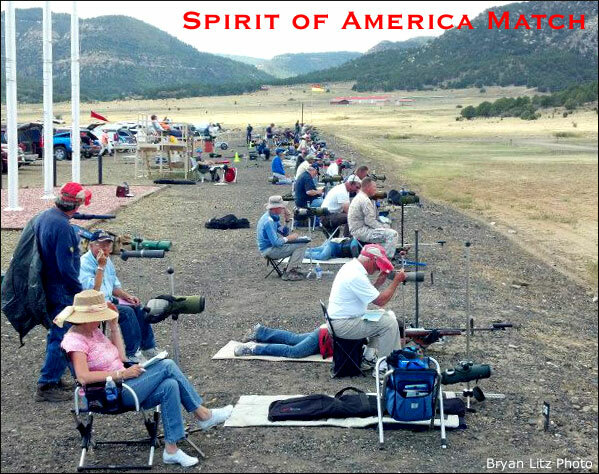 Share the post "Match Report: Day 3 at Spirit of America in Raton"
Black Powder Cartridge Rifles (BPCR) typically fire cartridges with large capacity — 70 grains or more of the ‘holy black’. For a variety of reasons, BPCR shooters may want to use a black powder substitute when training, hunting, or when competing in matches that allow substitutes. The problem with most smokeless propellants is that they are designed to operate at much higher pressure levels and they don’t fill the case well when loaded to black powder pressure levels. (There are some exceptions). 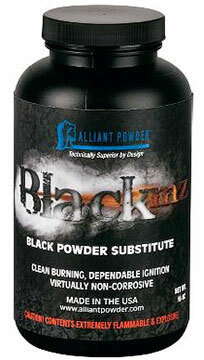 Alliant Powder has developed a new black powder substitute that works well in black powder cartridge rifles and in muzzle-loaders. Alliant’s new Black MZ is an innovative, non-corrosive black powder substitute that resists moisture and reduces cleaning time. Alliant claims that Black MZ “burns cleaner for less residue and easier cleaning” and that Black MZ can deliver “better velocities at lower pressures.” In fact, Black MZ performs so well that it was recently awarded Field & Stream’s “Best of the Best” award in its product category. Alliant Brand Director Rick Stoeckel declares: “We are excited to win the Best of the Best from Field & Stream. We strive to provide the best products for our consumers, and this recognition reaffirms the effectiveness of Black MZ” [for both muzzle-loaders and Black Powder Cartridge Rifles]. Share the post "Alliant Black MZ Wins Field & Stream ‘Best of the Best’ Award"
Are you bored with your “whimpy” .50 BMG? Looking for something with a little more punch? Well J.D. Jones and his team at SSK Industries have created a truly big boomer — the .950 JDJ. As its name implies, rifles chambered for the cartridge have a bore diameter of 0.950″ (24.13 mm). This would normally make such rifles “destructive devices” under the 1934 National Firearms Act (NFA). However, SSK obtained a “Sporting Use” exemption allowing the rifles to be sold without special restrictions as destructive devices. CLICK HERE to watch .950 JDJ being fired. As crafted by SSK Industries, .950 JDJ rifles use McMillan stocks and very large-diameter Krieger barrels fitted with a massive 18.2-lb muzzle brakes. The ammo produced by SSK features solid 3,600 grain bullets and CNC-machined cartridge brass. It is also possible (through a lot of work), to use a 20mm cannon casing shortened and necked-down.The primer pocket is swaged out to accept a .50 cal machine gun primer. 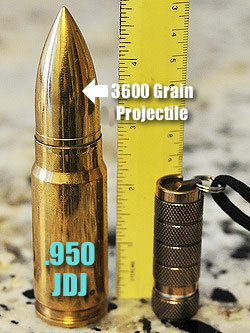 That 3,600 grain bullet is just massive — it weighs more than half a pound. 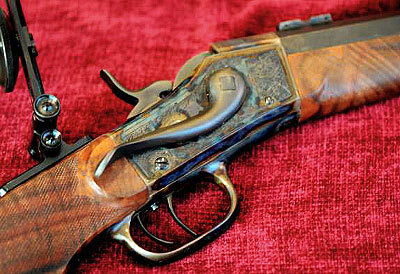 The cartridge propels its 3,600 grain bullet at approximately 2,200 fps. This yields a muzzle energy of 38,685 ft-lbs and a momentum of 154.1 Newton-seconds. The energy on target (knock-down power) is comparable to WWI-era tank rounds. Share the post "Beyond .50 BMG — The Jumbo .950 JDJ"